Celeriac is generally considered to be a winter vegetable. Velvety celeriac soup, sausages with celeriac mash, beef stew simmered with carrots, celeriac and shallots – comfort food at its best. 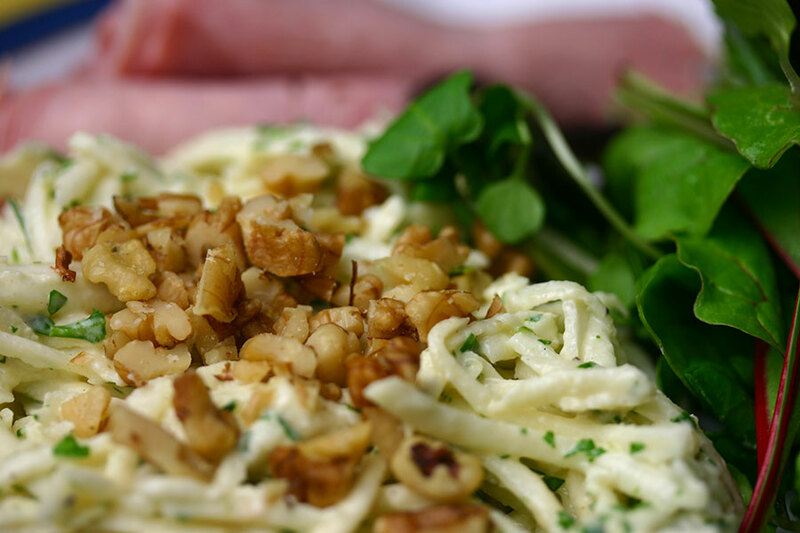 Celeriac remoulade has opened my eyes to its warm weather possibilities. A fresh, lighter alternative to potato salad, we’ve been eating it all summer long. A couple of slices of cold ham, a mound of celeriac remoulade and some salad leaves makes a lovely light supper. Peel and coarsely grate the celeriac. Toss it with the lemon juice immediately to prevent it going brown. Whisk together the mayonnaise, creme fraiche and mustard, and mix with the celeriac. Stir through the chopped parsley and season with salt and pepper. Let the salad sit for half an hour so that the dressing softens the celeriac a bit. Garnish with chopped walnuts just before serving.